Branded berry plants are one of the big trends on the European market, following success in the United States and Canada. Lucky Berry is the newest concept on the European market. For this brand German nurseries Heinje and Christoph Marken developed berry products together with Dutch nursery Van Son & Koot and Verdia from France. 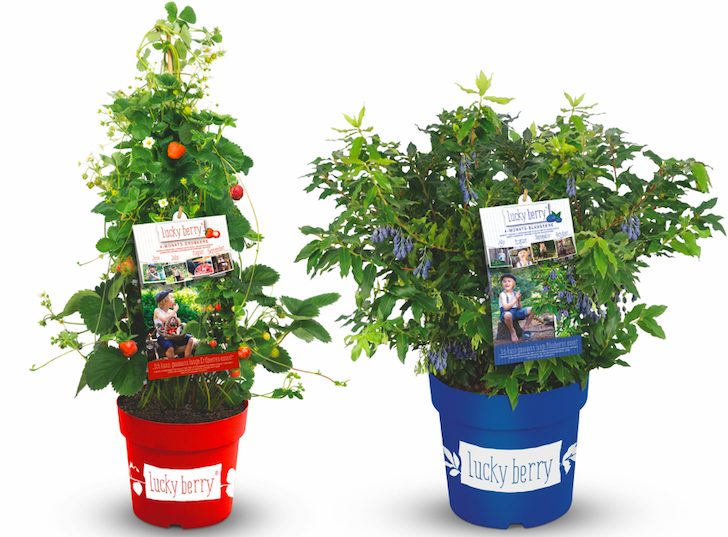 Lucky Berry promises fruit for four months and is also attractive as ornamental plant in gardens and patios. Last year Lucky Berry blueberry won already important German awards, Taspo Awards, for best marketing concept and best point of sale. Now strawberries are added to the collection, this year they will be introduced in retail. BrazelBerry is another branded collection on the European market. This year German nursery zu Jeddeloh and Dutch nursery De Jong Plant introduce Raspberry Shortcake. BrazelBerry also won an important award in Germany, three years ago it was the best new product at IPM tradeshow. The varieties for BrazelBerry are original American, developed by Fall Creek Nursery. Last year Star Roses and Plants bought the brand and gave it a new name: Bushel and Berry. More likely to appeal to consumers in the US and Canada.